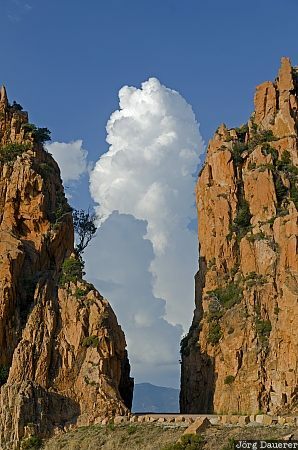 A wall of white clouds is building behind the spectacular red granite rocks of the Calanche (Les calanches de Piana). The Calanche is north of Piana on the mediterranean island Corsica, France. This photo was taken in the evening of a sunny day in September of 2011. This photo is part of the exhibition White Clouds (February 2012). This photo was taken with a digital camera.